Loving Rush, With All My Heart And Brain : The Record Fans on either side of the "kingdom of cool" are feeling mean, mean pride for the band as it's elected to the Rock and Roll Hall of Fame. 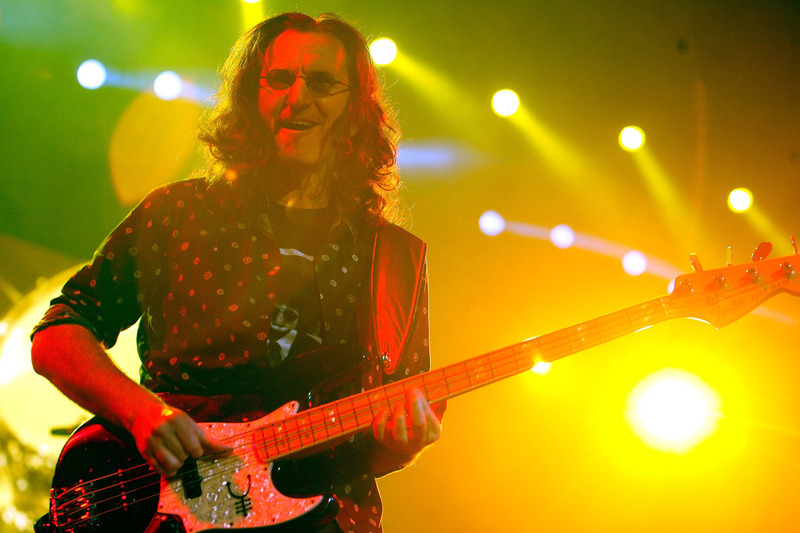 Geddy Lee of Rush performs at the Barclays Center on October 22, 2012 in Brooklyn. Ratty jean jackets — and pocket protectors. Chess fanatics and potheads. Greasers and nerds. How have seemingly two seemingly separate communities, with the entire empire of coolness standing between them, taken the same band to their hearts? That's the paradox of Rush, which just won admission — finally — to the Rock and Roll Hall of Fame. How does the same band speak to auto mechanics and MIT grads? And why did it take so long for the Rock Hall to notice? I'm a big Rush fan. (There, I said it!) For ages, admitting that in public was like striking up a conversation with an attractive woman in a bar about, say, Dungeons and Dragons. It just wasn't done. A 2008 article in Rolling Stone compared Rush fans to Trekkies. Recently, it's gotten easier to be a public Rush fan without fearing the loss of your cool credentials. A 2010 documentary, Rush: Beyond the Lighted Stage, featured musicians from bands like Tool, Nine Inch Nails, and Rage Against the Machine coming out as Rush fans. That helped. Most of the time, though, public admiration for Rush has been accompanied by that modern phenomenon: the semi-air-quote, that way of conveying an embarrassed mixture of irony and sincerity that says: "I like this, but I know it's unhip. Which makes me more hip for admitting it. But I'll take it back, if you insist." Liking Rush is supposed to be a joke, but not a joke. The band was in on it, too, appearing on The Colbert Report and in the bromantic comedy I Love You, Man. Personally, I don't just love Rush. I love them unironically — from a place that's, well, closer to the heart. I fall on the "nerd" side of the Rush paradox. I'm a law professor. I spend a good deal of my time teaching and writing on difficult or obscure issues. My passport to Tolkien's Middle-earth was stamped early and often as a kid. Rush appealed to the nerd in me. Not so much because their earlier songs featured the occasional fantasy or science-fiction plot; blessedly, they abandoned most of that a long time ago. It wasn't the Ayn Rand influence either, although like many nerds I had my Fountainhead phase. On that, I'm with drummer and lyricist Neil Peart, who told Rolling Stone, "That was 40 years ago." So what was it? There's an important sub-species of nerd: the musical nerd. I'm a drummer as well as a law professor. There's a whole pantheon of "musicians' musicians," hidden from public view: virtuosos whose sheer skill at their instrument has other musicians enraptured by their noodling. These musicians stay in business by appealing to musical nerds, and virtually no one else. If the words "fusion jazz" or "Dream Theater" don't immediately induce vomiting, you might just be a musical nerd. Nerds and greasers have another thing in common: We like to rock out. Rush gives both groups that precious outlet. Not only that; unlike most rock fixtures, they're actually rocking harder over the years. Each of their last three studio albums over the last decade has been surprisingly vital. (Try "Far Cry" from Snakes & Arrows, or "The Wreckers" from this year's Clockwork Angels.) They've dropped the warbling synthesizers and high trebles of their work in the late '80s, and gotten heavier and crunchier. Students, if you see me in my car in the faculty parking lot air-drumming, with my head bouncing up and down, I'm rockin'; please don't come a-knockin', at least until office hours. Rush fans of both the nerd and hesher variety have one last thing in common: a dose of good old-fashioned alienation. That's something that never goes out of style. Again, Rush has our back. I recently saw Rush play a show in Atlanta. The crowd ranged in age from five to the mid-fifties, embracing both lank-haired teenage skateboarders and heart surgeons. And when the band launched into its ode to suburban anomie, "Subdivisions," everyone got it. If you were a smart kid, you lived that song in your youth, and a little thing like academic tenure won't make you forget it. And if you weren't, you lived it too. Even loners want to belong, though. That's why Rush fans pushed so hard for the band to be recognized by the Hall of Fame and rejoiced when they were. If our sense of independence was fueled by Rush's "uncool" status, the band's arrival in the Hall of Fame gives us something else. It tells us there's room for the nerds and greasers, the chess champions and air-guitar kings, in the pantheon — and perhaps that there's a little bit of nerd or greaser in everyone else. Is Rush all there is? No. Give me your hipster music. Give me your DIY. Give me your Lou Reeds and Gang of Fours and other two-chord heroes. But don't forget that there's a band out there that managed to speak to the folks on the distant, opposite sides of the outer borders of the Kingdom of Cool, to the geeks and the greasers, and maybe to you, too, at the same time — and in 7/4, no less. Paul Horwitz teaches constitutional law at the University of Alabama. He is the author, most recently, of First Amendment Institutions (Harvard University Press).